On September 27th, there wasn’t just a lunar eclipse… There was a large magnificent full moon in the sky. Therefore once I had all my gear setup and ready for the show, I decided to snap a few frames before the start of the eclipse. The sky was wonderfully clear and the seeing great. Through the telescope I noticed very little turbulence in the air. Below is a stack of 11 frames, to which I adjusted the color, the levels and played with the wavelets sharpening to get some detail out of the lunar surface. Click on the photo for a full resolution version. 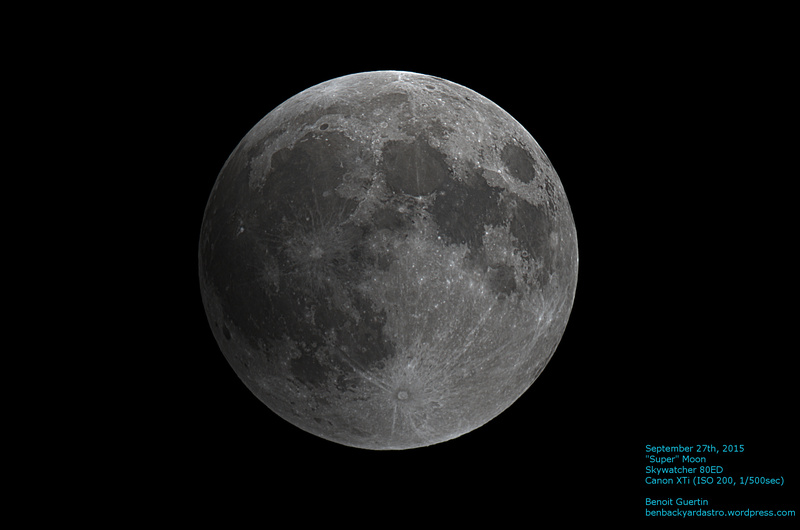 This entry was posted in Events, Photo and tagged Astrophoto, Astrophotography, Full Moon, Moon by Benoit Guertin. Bookmark the permalink.